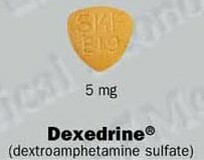 Dexedrine is a single entity amphetamine product combining the neutral salts of dextroamphetamine and amphetamine, with the dextro isomer of amphetamine saccharate and d, I-amphetamine asperate. Amphetamines can be habit-forming, and prolonged use may increase the risk of dependency. Check medicines with healthcare provider. Monoamine oxidase inhibitors (eg, isocarboxazid, phenelzine, or tranylcypromine) must be stopped 14 days before this medicine is started. The two together could cause dangerously high blood pressure. You may not be alert. Avoid driving, doing other tasks or activities until you see how this medicine affects you. Limit caffeine (for example, tea, coffee, cola) and chocolate intake. Use with this medicine may cause nervousness, shakiness, rapid heartbeats, and anxiety. Use caution if you have high blood pressure. Talk with healthcare provider. Do not use over-the-counter products that increase blood pressure. These include cough or cold remedies, diet pills, stimulants, ibuprofen or like products, and certain herbs or supplements. Talk with healthcare provider. Tell healthcare provider if you are allergic to any medicine. Make sure to tell about the allergy and how it affected you. This includes telling about rash; hives; itching; shortness of breath; wheezing; cough; swelling of face, lips, tongue, throat; or any other symptoms involved. Tell healthcare provider if you are pregnant or plan on getting pregnant. Do not use if you are breast-feeding. Serious - Irregular heartbeat, chest pain, increased blood pressure, skin rash, uncontrollable movements of arms and legs, mental changes, unusual weakness, very high fever. Call your doctor immediately. Common - Mood changes, insomnia, drowsiness, restlessness. Less Common - Blurred vision, constipation, diarrhea, loss of appetite, headache, increased sweating, stomach cramps or pain, nausea or vomiting, changes in sexual desire or decreased sexual ability. Hyperactivity, irritability, personality changes, schizophrenia-like thoughts and behavior, severe insomnia, severe skin disease. Do not take Dexedrine if you are sensitive to or have ever had an allergic reaction to it. Do not take Dexedrine for at least 14 days after taking a monoamine oxidase inhibitor (MAO inhibitor) such as the antidepressants Nardil and Parnate. Dexedrine and MAO inhibitors may interact to cause a sharp, potentially life-threatening rise in blood pressure. Signs of a life-threatening reaction. These include wheezing; tightness in the chest; fever; itching; bad cough; blue skin color; fits; swelling of face, lips, tongue, or throat. Chest pain, pressure, or fast heartbeats. No improvement in condition or feeling worse. How the Dexedrine Functions - Hundreds of animal studies and human clinical trials leave no doubt about how the medications work. First, the drug suppresses all spontaneous behavior. In healthy chimpanzees and other animals, this can be measured with precision as a reduction in all spontaneous or self-generated activities. In animals and in humans, this is manifested in a reduction in the following behaviors: (1) exploration and curiosity; (2) socializing, and (3) playing. Second, the drug increases obsessive-compulsive behaviors, including very limited, overly focused activities.